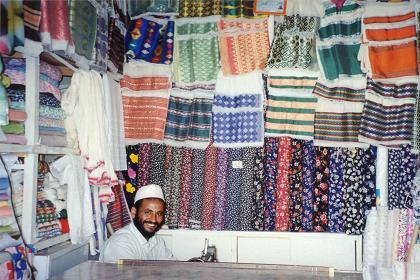 There are many small well stocked shops and skilled crafts people throughout the city. Good buys are gold and silver jewelry (sold by weight), woodcarvings, leather items, spears, drums, carpets and wicker goods. 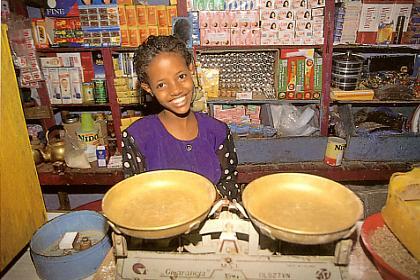 In market places a certain amount of bargaining is expected, but prices at shops are usually fixed. Shopping hours: 8:00 - 13:00 and 14:30 - 20:30 Monday to Saturday. Smiling welcome from a shop assistant. Square Asmara. 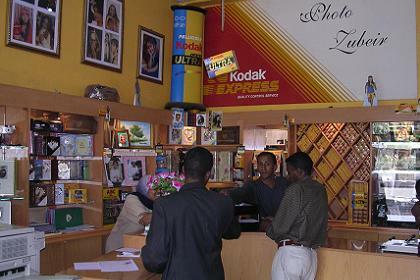 (books, maps, souvenirs, postcards, audio and video). 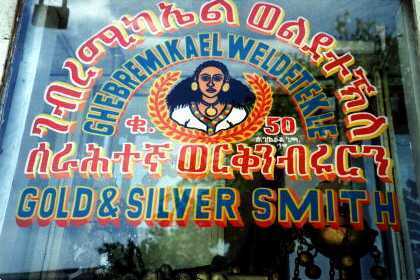 Shop window of a gold & silver smith. Photo Zubeir Harnet Avenue (opposite to Commercial Bank). 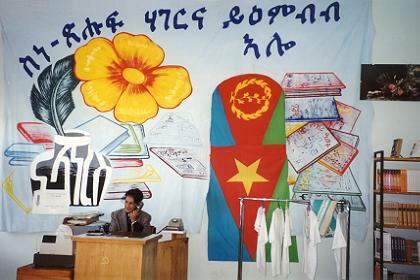 Colorful traditional clothing in a tailors shop in Asmara. 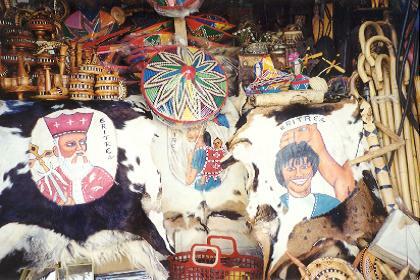 Colorful souvenirs in a souvenir shop in Asmara. 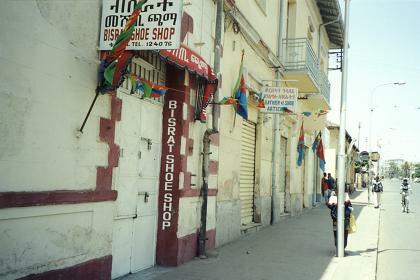 Bisrat shoe shop in Asmara. Christian butcher. The Red cross means that this is a Christian butcher. 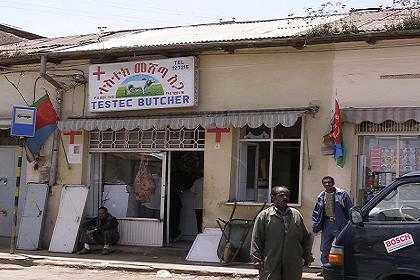 The local currency of Eritrea is the Nakfa. The Commercial and the Housing bank provide exchange services for various currencies, but many people prefer the shorter lines and better rates provided by the small (but official) exchange offices. Do not attempt to change currency on the streets, since it is not allowed. if you do indulge, you're taking a big risk for a small gain. 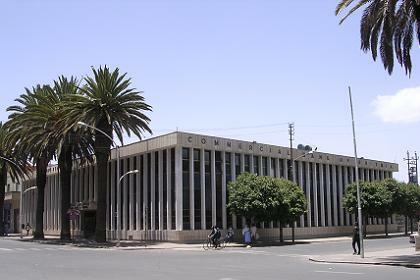 Commercial bank of Eritrea - Harnet Avenue Asmara. 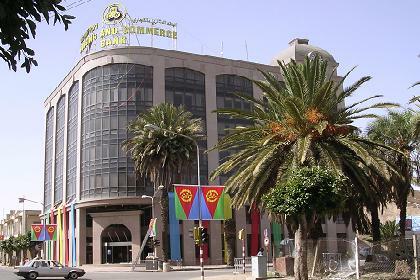 Housing and Commerce Bank of Eritrea - Meskerem Square. 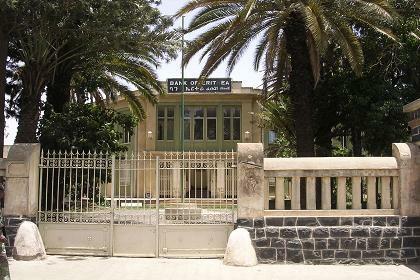 Caserma Musolini and former National bank of Eritrea - Harnet Avenue. 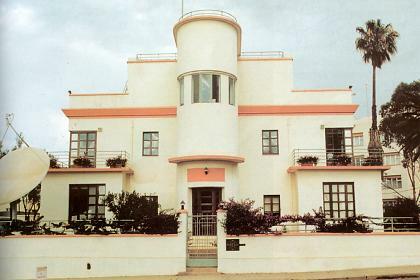 The building was once a military barracks during the regime of Mussolini. The World Bank Office - modern rationalist style - Asmara Eritrea. 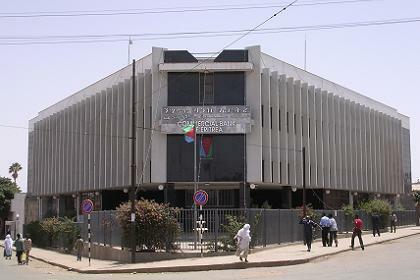 New location of the Commercial Bank - Asmara Eritrea.